Earlier this year, I travelled across the province as part of the Tony Dean Review of the Ontario College of Trades (OCOT). During the consultation we met with builders, renovators and developers to discuss their challenges with the provincial training and apprenticeship system, as well as recommendations to modernize that system. Each local Home Builders’ Association, member company and trade contractor taught me something unique about their region. For example, in Waterloo and Kingston, there are exitting partnerships with local colleges and high schools through Ontario Youth Apprenticeship Programs (OYAP), where home builders are providing real construction experience for young men and women considering a career in the skilled trades. In Thunder Bay, our members are helping build housing for on-reserve First Nations and employing local aboriginal labour. In Sarnia, I met with builders who are finding creative ways to compete with the high wages paid in the oil and gas refining industry. In Ottawa, I learned that almost half of all the labour force building new homes comes across the border from Quebec because there is not enough local labour to perform the work. While there were local trends unique to different areas, there were also other patterns that emerged. For instance, the further I travelled from urban areas in Southern Ontario and the Ottawa region, the more I discovered that the residential building community begins to blend in with institutional, commercial and industrial building sectors; in some cases residential builders also have separate divisions that specialize in local infrastructure projects such as road and bridge building. Each part of the province tells its own story about how homes are built and renovated. Local builders are adept at creating local solutions to their problems. Employers were not asking for government money to hire apprentices. Instead, our members were looking to partner with government and OCOT to promote the skilled trades and make it easier to hire apprentices by lowering ratios that cap how many apprentices a company can hire. The conversations with our members about the future of the training and apprenticeship system speaks to the entrepreneurial nature of our industry. And while almost everyone was concerned about regulatory barriers and demographic challenges of an aging workforce, the meetings with Tony Dean, the former head of Ontario Public Service, highlighted some fantastic stories about young people who are motivated and excited about the future of their chosen career in construction. That is the good news. The bad news is that there will be a critical shortage of workers in construction trades across Canada over the next 20 years. One recent estimate suggests a shortfall of 200,000 workers in the residential construction sector alone. The reasons are not surprising: an aging workforce coupled with strong demand for construction services in new housing and renovation. According to a recent report, Labour Market Assessments for the Residential Construction Industry 2015-2024, conducted by Build Force in collaboration with CHBA, Ontario will have to replace more than 4,000 workers annually for the next 20 years. While the report identifies the importance of immigration in solving this puzzle, Ontario cannot just rely on other countries to train workers to build our province. Our province’s youth need to be part of the solution, as do older workers who want retraining. Across Ontario our industry employs and trains a lot of apprentices, but that fact is not always recognized since the training is happening in small businesses, not large union training centres. While there may not be the photo-ops or media coverage of training in our sector compared to others, the consultation on the future of OCOT highlighted a new passion and excitement for the trades that proved that young people and workers being retrained in our sector are showing they can not only compete with others provincially, but also excel on the world stage. 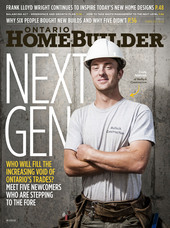 Meet five of Ontario’s best and brightest—our next generation of skilled tradespeople. For young people whose parents run a family business in the construction industry, following in their footsteps may seem to an outsider like the easier career path. And while there is a perception that second and third generations might start to become complacent, 23-year-old Cody Malloch challenges that stereotype. Cody’s father, Donald Malloch, continues to run the family business, Malloch Construction, an established new-home building and renovation company. Cody’s brother Jeremy is also with the family businesses, which include a fully functioning cattle farm about 10 kilometres northeast of Perth. The Mallochs are members of the Lanark-Leeds Home Builders’ Association, a local that punches above its weight class in terms of membership numbers, influencing local politics and provincial government relations advocacy. The underdog mentality also makes its way to Cody, whose exceptional talent and skills were duly noted in the carpentry program in which he was enrolled while attending Algonquin College in Ottawa. His teachers selected him to compete on behalf of Algonquin at skills competitions across the province. After winning competitions in Ottawa and Kitchener in 2013, Cody moved up the ladder to compete at the Canadian Skills Competition in Edmonton, winning first place in the carpentry division. That win gave him a shot on the global stage, where he took part in the annual World Skills Competition in Germany, the largest skills competition, jobs and careers event in the world, representing 45 trades and thousands of volunteers, spectators and participants. The purpose of the event is to advance vocational skills education and training worldwide, enabling competitors to network, share best practices and gain invaluable experience and training that they can carry into their careers. In the carpentry competition, Cody was up against the best from all over the world—each building a section of a gazebo, guided by a rough blueprint. After the sawdust had settled, Cody placed 11th overall, netting him plenty of lucrative job offers from big companies and unions. While Peder Madsen had a direct line to the trades through his family’s business, CCR Building & Remodeling, as a high school student he didn’t see himself in construction and expected to work at an office job. However, as Peder matured and saw some of his friends struggle to find work opportunities after university, he began to see his family business as an exciting option. Peder is eager to encourage more young people to join what he sees as an exciting, challenging industry. Stephanie Clark is just one exam away from punching her ticket to become a carpenter journeyperson. During her enrollment in the three-year Conestoga College program, Stephanie was presented the Rona Achievement Award. Monty Romeo got a taste for construction at a very young age through his family’s roofing and millwright company in Northwestern Ontario. While at high school, Monty spent his summers employed as a tin-basher and general labourer, which was very hard work, but he persisted until 2008, when the company was sold. While studying civil engineering at Confederation College, Monty realized he wanted to learn something more practical, so enrolled in the carpentry program and now holds a Certificate of Qualification as a general carpenter. With the support of his father, 25-year-old Monty is now the owner of Thunder Bay-based Burmet Northern Ltd. (BML). His firm’s success is the product of ingenuity and flexibility, two necessary ingredients required by construction companies in rural and northern communities that hope to thrive in a challenging market. BML builds condominiums and new office buildings, along with the construction of sewer and water infrastructure and soil remediation, while employing over 20 full-time staff during the peak summer season. About half of BNL’s business consists of work in eight different remote northern communities, primarily on First Nation Reserves that are often only accessible by plane. The firm is currently completing a Health Unit and classrooms for the Kashechewan First Nation and also renovated 70 houses that were damaged by significant flooding on the reserve in 2013. A key requirement to work in those communities is to use local labour. Typically one local resident has to be employed for every two people that are brought in, although each community has its own set of requirements. Like other rural areas of the province, there are challenges with training opportunities for apprentices in Thunder Bay. “It’s harder getting into the in-class component of trade school than it was to find work,” says Monty. A mature student, Dana Gray is a recent graduate of the three-year Construction Engineering Tech­nology Program at George Brown College in Toronto. The program is offered through the Angelo Del Zotto School of Construction Management and focuses on industry management practices, contracts, bidding and estimating, surveying construction law, as well as managing schedules and cash flow. Dana is also a member of the Canadian Association of Women in Construction (CAWIC), a non-profit association whose mandate is to facilitate the long-term success of women in Canada’s construction-related fields. While female representation was low in Dana’s class, she sees perceptions about women in construction changing. “There are lots of opportunities for women in all construction fields and lots of ways for them to contribute. It’s a viable workplace for women and perceptions are starting to change. Being able to graduate with honours has been a wonderful experience, and I know my job is out there and I just have to find it.